Marc Davis, visionary technologist and inventor, is a founding partner of Invention Arts. With a distinguished career of technology research and development at the MIT Media Lab, Interval Research, UC Berkeley, and Yahoo!, Marc’s thought leadership has articulated—often over a decade beforehand—how people, the web, and the world will be connected. For over two decades, Marc and his teams have done pioneering research and development in digital video databases and remixing, automated media production, multimedia information systems, computer vision, mobile and context-aware computing, mobile media, social media, and mobile and social advertising. With a radically interdisciplinary background, unique insight into the future of technology, media, and society, and the ability to develop and apply highly generative invention frameworks, Marc has transformed his breakthrough ideas into over 150 patent applications, as well as research prototypes and products. Most recently, Marc was Chief Scientist and Vice President of Early Stage Products (ESP) for Yahoo! Mobile. At Yahoo!, Marc and his team invented and helped realize the future of mobile, social, media, monetization, and platforms. While developing a large portfolio of strategic and disruptive patents and internal prototypes, ESP worked with product teams on innovative products from Yahoo! Mobile such as Social Pulse that reinvents mobile communications by aggregating a user’s social networks and communications tools into a socially connected address book. Marc was also a key contributor to the Yahoo! Open Strategy (Y!OS) and the vision demo for the future of Yahoo! 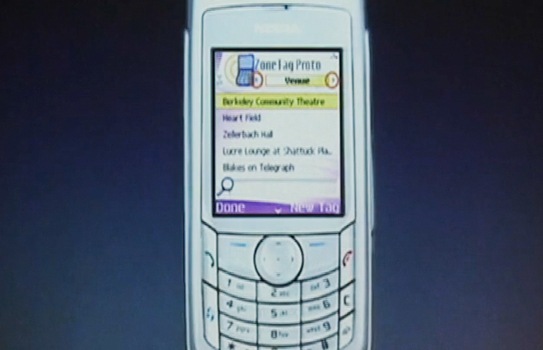 shown at CES 2008.